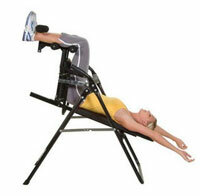 Using an inversion chair as a method for traction therapy can be very beneficial if you suffer from back pain. While this therapy technique has been used for centuries, it’s only recently that the inversion table industry has matured and we are now seeing tremendous growth in inversion chair and table options. Read on for a discussion of some of the reasons why inversion therapy using inversion chairs can be very beneficial to one’s health – and not just beneficial from a post-trauma treatment perspective, but from a prevention perspective as well. First of all, if you are injured in your neck or back regions you may be able to find very meaningful relief by simply using an inversion chair 5 to 10 minutes a day, 3 to 5 times per week. Some studies have shown that emg (which is a measure of back pain) decreases as much as 35% withing just a few SECONDS of inverting by 60% or more, giving instant and long-term pain relief from those who suffer from a variety of back vertebral disc problems. Second, inversion therapy makes sense due to the fact that it is mechanical in nature. As most back problems (bulging discs, etc.) are also mechanical in nature, it makes sense to use a mechanical process to help repair and relieve the problem. Third, you can (and I would argue should) use an inversion chair to help relax your muscles, increase blood and lymph flow…and thus help prevent injuries that can occur from your muscles and body being tight. Simply put, you do not need to already be injured to enjoy many benefits and advantages of inversion therapy – many people simply invert daily for a few minutes to help relax their bodies and mind, bringing themselves into balance after a long hard day or after a long hard workout. In fact, many athletes have found inverting after working out to help recuperation times and to decrease soreness, as the acid that causes soreness is more effectively removed from the system via the lymphatic system.